The Institute is creating the first wide-ranging national survey of Canada’s amazing, and ordinary, treasures in traditional and modern glass. Your help is genuinely needed and warmly invited. After the CPR was completed in 1885, expansion into the West saw the establishment of prairie capitals fueled by an explosion of agriculture. Success and optimism led to fine buildings across the West, in the Euro-Christian traditions of settlers celebrating their faith through traditional religious architecture. Glaziers trained in Great Britain established workshops in cities across the country. Even small churches could afford decorative glass of some kind, ordered by catalogue from the East; or from the local window store, which could also make fashionable floral designs for Victorian and Craftsman-style homes. A golden age of Canadian architecture – from about 1890 to the beginning of World War One – saw the construction of Anglican, Roman Catholic, Orthodox, Ukrainian, Presbyterian and other churches in European styles. Leading studios were busy under European founders: Robert McCausland and Nathaniel Lyon in Toronto, Henry Bloomfield in Vancouver; and post-war, the Florentine Guido Nincheri in Montreal. A remarkable proportion of our best older buildings have cornerstones dated 1912, and are embellished with elegant glazing created here and abroad. In the early 20th century wealthier parishes often commissioned windows from England (Morris & Company, Clayton and Bell, A.L. Moore, Blackfriars, Henry Holiday, Heaton Butler and Bayne, G. Maile), France (Rault Frères, Gabriel Loire, Chigot of Sevres), Germany (the great Frederic Mayer), Wales (Celtic), Ireland (Dublin, Wilhelmina Geddes), Austria and the United States (Tiffany). Here are some 160 signatures we have found in windows by Canadian and European studios. The construction of elaborate buildings was retarded by the two World Wars and by the Great Depression. When religious architecture regained its composure in the post-war 1940s, church and temple designs were more contemporary. 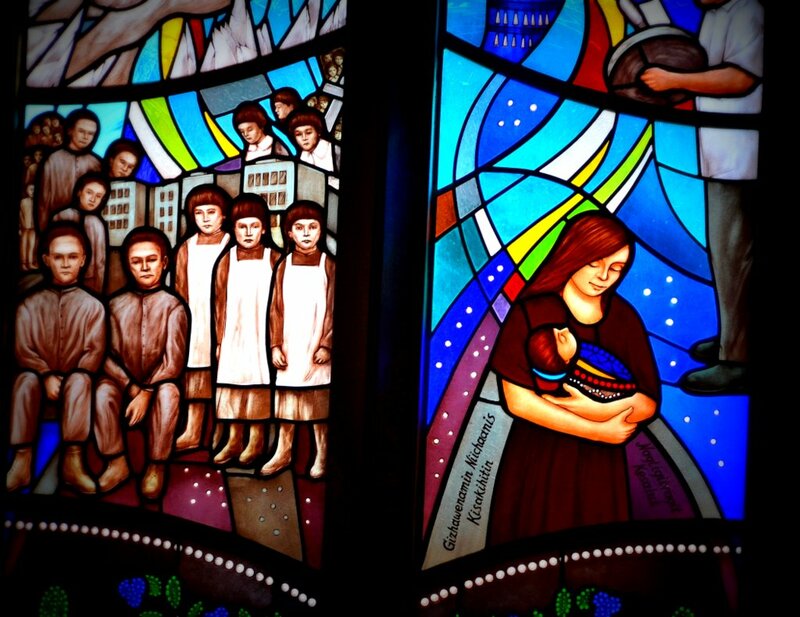 In Montreal, the artist Marius Plamondon created modernist windows at Saint Joseph’s Oratory in the 1950s. Unfortunately, when Canada’s economy boomed in the 1950s, some irreplaceable downtown churches from the 19th and early 20th were demolished for new commercial buildings. Whatever great windows those discarded buildings might have housed are irretrievably lost, most with not even photographs to remember them. By the early 1960s glass making was vigorous again, and while a few older studios survived, modernist workshops and artists sprang up in most large cities. Fresh generations of craftspeople applied both ancient and newly developed technologies. The French studio of Rault Fréres in Rennes (Brittany) created windows using richly hued dalle de verre (“slab glass”) for nearly a hundred Catholic buildings in Québec and the West between 1948 and 1990. Gabriel Loire of Chartres made dazzling dalle windows for Vancouver; while migrant artists like Christopher Wallis (from England) and Lutz Haufschild (Germany) raised Canadian glass artistry to new heights. Studios must also perform essential ongoing maintenance of the supporting web of lead cames, weakened over time by extremes of temperature, wind storms, vandalism and metal fatigue. This complex and expensive ongoing task demands the skills to remove, repair, re-lead and restore windows that may be 50 or 150 years old. Only highly trained and experienced crafters can authentically recreate older panels after major fire damage in historic structures. Glass itself, although fragile, is remarkably stable in colour and form. In the late 20th and early 21st centuries, Canada’s glass artists continue to create contemporary glazing for churches, synagogues, temples and mosques of many faiths, and for a wide range of public buildings, from the Montreal Metro to the House of Commons. Glass workers in every province continue the ancient tradition in styles ranging from Medieval, Victorian, Art Deco and 20th century Modernism, to naive, Pop and folk art, Abstract, and 21st century avant-garde. Leading designers often collaborate with architects to create dynamic works in contemporary styles, using new techniques and materials like dalle de verre, casting, fusing, CAD, etching, electrovoltaic receptors and dichroic glass. Of exceptional interest is the award-winning work of the Toronto artist Sarah Hall who has created many large and technically innovative installations across Canada, in New York and other American cities, and in Europe. The art of glass continues to evolve as a noble complement to public architecture. Please check back soon for our visits to studios in Nova Scotia, Montréal, Toronto, Lake Huron, Winnipeg, Regina, Calgary, Edmonton, Vancouver and Victoria.